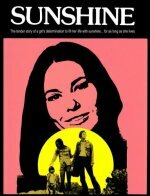 Sunshine: A young woman living in the woods with her husband, a struggling musician, and her daughter discover she has terminal cancer. She begins to tape-record a journal of the time she has left. Sunshine Christmas: A musician, brooding over the marriage of his sometime girlfriend, decides to take his adopted daughter to his home in Texas to celebrate Christmas with his family. While there, he begins to rekindle the relationship he once had with his childhood girlfriend. Because both these films have not been shown for a very long time and they have been sourced from old vhs recordings please be aware the transfer to dvd would put them in the "watchable" category.